Why should I use Tonka Party Ideas? Because Tonka Birthday Party Supplies are so easy to find, and because kids love Tonka Trucks! Tonka has parked its toy trucks and construction equipment in our homes for over fifty years. Allow Tonka to host your next birthday party, holiday party, or play date party. There are so many great Tonka party ideas and activities to do. You can find all the Tonka birthday party supplies you will need at . Get a few of the fun party decorations and you can buy plain yellow cups and plates at your local grocery store. Splurge on the fancy napkins! Make sure you check your party budget before you go shopping online! Celebrate Express has some construction cone cups with straws that are really cute and look great on your party table. Fill your Tonka goodie bag with truck note pads, truck pencils or erasers, Tonka bubbles, Truck tattoos, Tonka twisty turns, and mini Tonka trucks. Send a Tonka activity/color book home with your guests, too. You can make a coloring pages activity book with printable truck coloring pages. Put a few together, punch a hole in the left top corner and use some yellow wool to tie it. Now you've got a homemade coloring book to use as a party favor. Add a small box of crayons and you're done! Below there is a link to take you to some free, printable Tonka coloring pages. 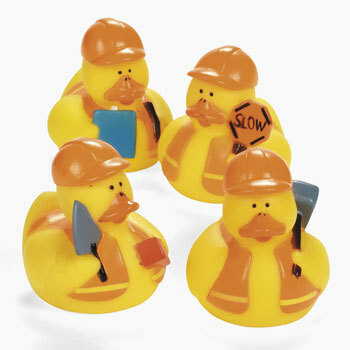 I just had to show you these cute little construction rubber duckies! I think these are some of the cutest rubber duckies I have seen! Who ever thought Tonka birthday party supplies would include construction duckies? Your Tonka party will be a smash hit...don't forget the hard hats!